The overseas team included doctors and nurses from the Royal Berkshire Hospital, Reading, The John Radcliffe Hospital , Oxford , U.K. and Dublin in Ireland. The Nepali surgeons came from Kathmandhu. 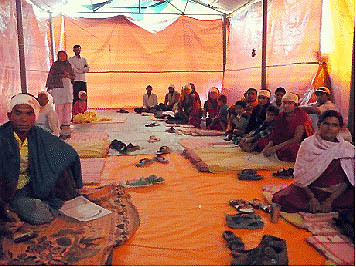 The Local BRINOS Community Ear Care Assistants, based at the Fateh Bal Eye hospital, screened the patients and were responsible for the post op care. The camp ran very smoothly with 110 “major ear” operations performed. In addition, on the last day, grommets operations were performed on children using ketamine anaesthesia, a common, safe, anaesthetic in developing countries, but very rarely used in the UK. Three operating tables were running simultaneously, two for local anaesthetic cases and one for general anaesthetic cases. 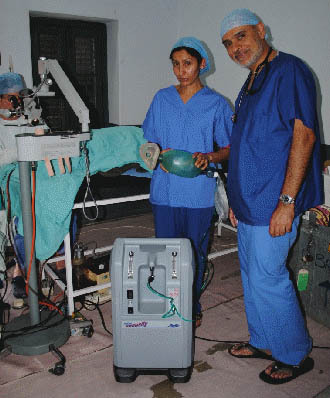 The anaesthesia was made safer by the generous donation of an oxygen concentrator by Dr and Mrs Kapila, from their charitable fund, the Aman Kapila Memorial Fund which has been established to commemorate their son. The concentrator concentrates the oxygen in the room air to 95% and pipes it to the anaesthetised patient. We were also delighted to have a continuous power supply thanks to the kind donation of a UPS (an uninterruptable power supply) by the Oxford/Bucks BAHA users group. There are frequent power cuts in Nepal and, although there is a hospital generator, there is always a variable gap between loss of power and the generator operator getting the supply back up again. During this time our operating microscopes and drills stop working, often at a crucial time. The uninterruptable power supply basically stores the electricity and immediately and seamlessly feeds it back in the event of a power cut. The above new equipment will be available for all future BRINOS surgical Camps.